The boys have taken up "Lord of the Rings Battle Gaming". As many of you know, I did a lot of wargaming before he moved to Sydney in 1993, but since then I have been waiting for the boys to get old enough to provide some competition. Initially, with the Lord of the Rings figures, they were just moving figures around and using their imagination. Then an invitation arrived in the mail to go to Gamesday 05 in Atlanta organized by Games Workshop. We arranged to spend the day at the convention center downtown in Atlanta - 2.5 hours away. Eric had a very good day. Rather than try out the various other games and activities on offer, he joined in to the many Lord of the Rings demonstration games. The first was a very large game being in command of Men of Gondor against nasty orcses (pictured here). The next game was controlling some orcs in Osgiliath, trying to cross the river and move through. I controlled some of the Gondorian defenders and I won that battle. Eric's last game was as the good guys again with some other homeschooling children controlling the evil forces. By the time they finished, Eric had played many hours gaming, and was filled with new knowledge of the game rules and mechanics. He has since shown James and Peter how to play. The game also involves painting the models, creating scenery and designing games. We went to Home Depot and haggled for a damaged LARGE sheet of pink insulation foam ($4.00). This is the basis for castle walls, hills and other large structures. The boys are doing a great job creating lots of scenery, with David providing assistance and advice. At church Rose has made many friends. Through her smiles and personality we now have many special grandparents. One of our special friends is Edith Smith who turned 88 recently and we were honored to be invited to her surprise birthday party. Unbeknownst to Mrs Smith, her family gathered from across the country, some she had not seen for up to sixteen years. 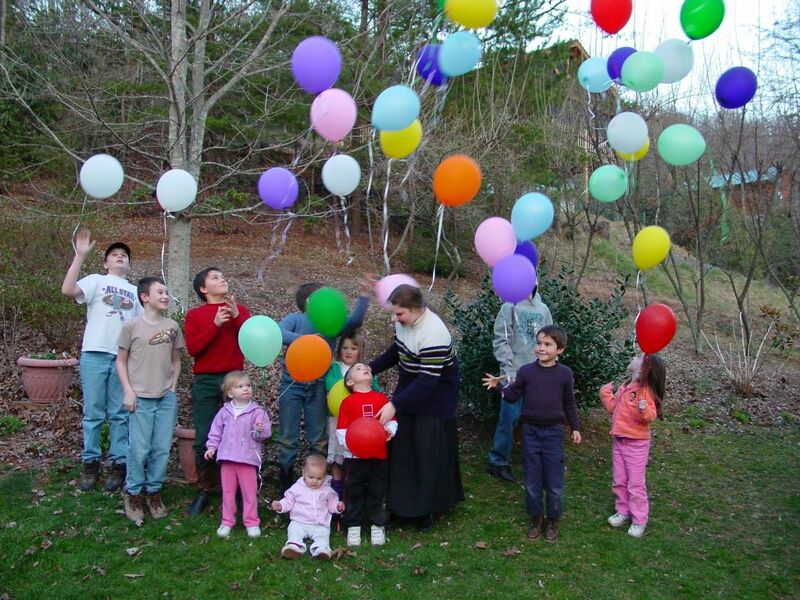 As each person arrived, they were given a helium filled balloon, and they popped in to see Mrs Smith one at a time. As each one entered the room, Mrs Smith was stunned. By the time all had arrived the ceiling was full of balloons with a blissfully happy Mrs Smith below in her chair. 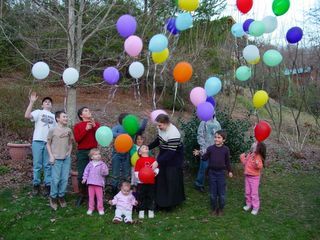 After meals and many discussions, the children went outside with the balloons and the balloons set free. It was a great feeling to be involved in such a family affair. Pleasant memories of family affairs back home reminded us of the importance of family. I have a number of disk utilities to help keep Windows trim. Bits and pieces are left all over the place from programs being added and removed and data in and out, so I ran the disk cleanup part of the program and it went and did it's thing. Normally I always run the program with the various prompts so I can see what it was doing. This time I didn't. And it went and cleared out all temp files. Including the one in My Pictures which I named temp for photos I had not organised yet. I only discovered after I had already replaced my nightly backup, and I ran a disk defragmentation which resorts files on the disk into a more efficient positions. The end result? I lost tons of photos from November to February. The photos prior to that I had copied to my laptop to show to family back home on my Novemeber trip. 1. Don't name folders temp unless they really are temporary and can be deleted. 2. Don't take the default option of any program unless you are really sure!